An innovative new touch-operated control is clearly evident on the back of the Canon EOS R camera. It’s the Multi-function bar (“M.Fn bar”), and it gives the photographer possibilities to quickly access and scroll through a range of choices, with a swipe of his or her thumb, like instantly make a specific setting change or bring up a shortcut to a feature with a tap of the thumb on the left or right side of the bar. Especially since the EOS R camera body has fewer buttons for immediate access to familiar features, the M.Fn bar can be a welcome addition to some photographers. In this article, we’ll touch on its operation, and how photographers can make — and change — their choices for working with this touch-sensitive control. The Canon EOS R is the first Canon camera to feature a touch-sensitive Multi-function bar, on the back of the camera. In this conceptual illustration, a user’s thumb is swiping sideways across its touch-sensitive surface. With AF Method selected as the operation for swiping the bar, you can see how different AF Method (active AF area) choices appear in the viewfinder, or on the LCD monitor. Maybe that’s the first place to start. The Multi-function bar is indeed touch-sensitive, and is definitely not a button you press inward. Think of the touch-sensitive screen on your smartphone, not the on-off button that you press on the same phone. What Can a Photographer do with the M.Fn bar? Quickly, here are a few examples. Let’s take a video user first — he or she could be a vlogger, using the EOS R for online videos, or a serious video operator who’s making documentaries, movies, or other projects. With a swipe across the bar, a user could immediately run through a range of available lens apertures. Or, he or she could (silently!) raise or lower audio levels, or change headphone volume. A still-image photographer likewise has a multitude of possibilities, literally at his or her thumb, once the M.Fn bar is set and activated. With a swipe across the bar, you can call up and immediately run through all available ISO settings. Or, likewise quickly change an AF Method (for instance, go from single-point AF to Face Detect + Tracking), run through the available WB settings, or change Magnification in the viewfinder from normal display, 5x magnification, and 10x magnification — a rapid way to verify focus before a shot is taken. A tap on either side can immediately call up a specific setting. Using the ISO option as an example, you can assign a left/right tap to instantly jump you to a user-defined ISO setting, or activate Auto ISO. Look at the Multi-function bar as a very fast way to access a camera feature you think you may want to change frequently, as you record video or shoot still images. 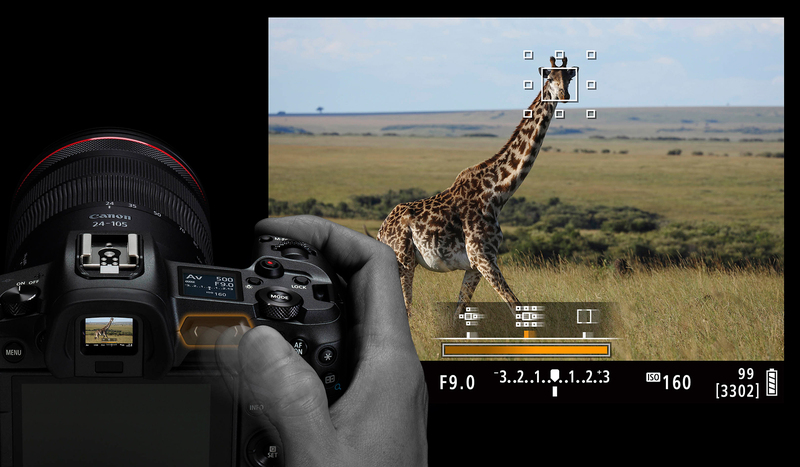 This is done on the 4th Custom Functions Menu screen of the EOS R. Scroll to Customize M.Fn bar, and either tap on it, or press the SET button to expand it. The full Multi-function bar screen appears. The Customize M.Fn bar screen is where you define what this touch-sensitive bar on the EOS R will do. At factory default settings, the bar is not active — and you’ll accordingly see “Not assigned” listed for both shooting functions and playback functions, as illustrated here. “User Customization” is a little different, and we’ll discuss it separately below. But for any of the other initial categories listed above, the available options will always have something to do with that category. In other words, if you select White Balance, each touch-oriented option will have something do with White Balance. Here is where you define what the Multi-function bar will do with a Swipe, a Left tap, and a Right tap. Each of the three actions provides you different possibilities. Again, except for the “User Customization” setting, the Swipe/Tap options will all be related to the heading you selected in the previous menu (White Balance, AF, Movie Shooting, etc). In this example, with WHITE BALANCE selected as the overall category, each of the three touch options will have something to do with setting White Balance. So taking White Balance as an example, for Swipe, you have a choice of swiping the bar and scrolling through your available WB options (Auto WB, Daylight, Tungsten, and so on, including Custom WB and Kelvin WB). Or, you could select “K,” and swipe the bar to instantly call up and change the color temperature if the camera was pre-set to the K WB setting. Select each function (Swipe, Left tap, Right tap), and assign any available choice to it — they’ll vary, depending on the category you selected on the previous menu screen. Here, with White Balance as the category, a Swipe can either run through the range of WB possible settings, or (highlighted here in orange) run through the entire available Kelvin WB scale. The Swipe action usually lets you run through a range of possible settings, whether we’re talking about White Balance, or other available settings (ISO speed, Movie Shooting, AF, and so on). For example, an AF option is to swipe your thumb on the bar and run through the available AF Method (size of active AF area) choices, allowing you to change them instantly. Then, there are separate entries for a Left Tap, and Right Tap (indicated by left- and right-facing arrows on the menu setting screen). Select either one, and tap the highlighted field next to the arrow, and new choices appear for what you want a left/right tap to do. The options for “tap” operations are the same for a left/right tap — in other words, if you’re presented with five options, for example, you can pick any one for a left tap. The right tap icon will present the same five options…you can select any one of the remaining four to be what will happen with a right tap. You can always select OFF if you don’t want a particular touch action to perform a task. For instance, if you find your thumb accidentally taps the right arrow frequently, you have the option of having no function assigned to the right arrow touch area of the bar. Once you’re done, just press the shutter button halfway down, or tap the MENU icon (or press the camera’s MENU button) to leave this screen, and lock in whatever you set. The bar is now active with your choices, and you’re ready to use it to quickly access the features you’ve selected. As described above, if you select a feature heading such as White Balance, ISO, or Movie Shooting, your available choices for Swipe/Left tap/Right tap are limited to something within that basic category. You cannot, for example, have a swipe run through your White Balance options, but a Left tap call up an AF setting. User Customization, however, does give you this option. Select User Customization from the list of feature categories at the top of the Menu screen, and a new menu screen appears, allowing you to select a “category” from which to pick an item for the Swipe option, and (if you want) different categories for your Left tap and Right tap. You could theoretically have something movie-related be applied with a swipe on the bar, jump to a user-defined ISO with a tap in one direction, and jump to a pre-set White Balance setting with a tap on the other arrow. M.Fn bar Always Active? Or, Have a Safety Lock? On the first Multi-function bar menu screen, you’ll see a pair of choices in the central area of the screen, under the heading M-Fn bar safety lock. ENABLE the lock, to prevent inadvertent touching of the bar from changing settings unexpectedly as you shoot. You have to unlock the bar first (we’ll explain how in a moment). DISABLE (always available). Anytime the camera is awake, if you tap either side of the bar, or run your thumb across it sideways, you’ll immediately activate it, and either bring up whatever shortcut you assigned, or change a setting assigned there. It’s your choice whether to activate a safety lock for the M.Fn bar, or to disable it. The latter means the bar is always available for touch operations, anytime the camera is awake. When you’re first getting used to the Multi-function bar, it may be easier to work with at the DISABLE setting, so you don’t have to contend with a separate process to activate it every time you want to use the bar. Just reach your thumb over to the bar, and touch either arrow icon the bar for a left/right tap, or swipe your thumb lightly across its length to immediately call up a linear display of settings/options in the viewfinder or LCD monitor. If you’ve enabled the safety lock, simply touching the bar will have no effect — that’s the intent of the lock feature. To unlock the bar, with the camera “awake,” you’ll need to place your thumb over the LEFT arrow, and hold it there for a full second or so. In either the viewfinder or LCD monitor, you’ll see a progress bar appear, moving left-to-right, and after a moment or two, the word ON appears. The bar is now active. The Full cover setting is a shortcut to let you call up the basic Customize Multi-function bar menu, so you can rapidly change what the bar does — for instance, you might want to change its operation from White Balance tasks to something like Movie recording options. It’s called Full cover because with it active, if you cover the entire bar with your thumb held sideways, and hold it there for a second or two, the basic setting screen appears on your LCD monitor, or viewfinder. This saves you the time required to manually drill down to the right Custom Functions menu screen. Briefly pull your thumb off the left arrow icon, and now you can touch the left arrow, right arrow, or swipe your thumb across the bar to perform your choices. After roughly 10 seconds of inactivity (no touching on the bar’s surface), the bar again becomes disabled, and you must again place and hold your thumb over the left arrow, and repeat the process to get the ON icon in your finder or LCD monitor — your indication that the bar is temporarily available again. You’re always free to change what you assign the M.Fn bar to do, with a return trip to the “Customize M.Fn bar” menu. Normally, however, that would require a separate trip into the Menu system, and drilling down from there. However, the Customize M.Fn bar gives you an option for a shortcut: the Full cover setting. At the bottom of the Customize M.Fn bar screen is the entry for “Full cover setting.” Press either the INFO button, or tap the INFO icon onscreen, to enter the setting menu screen for it. With the Full cover setting active, anytime the camera is awake, hold your thumb sideways over the full length of the bar, covering its surface, and hold it there for about a full second or so — the Customize M.Fn menu will appear. This will allow you to quickly redefine what the bar does, following the steps earlier in this article. Especially since it’s unlikely for many users that they’d accidentally rest their thumb over the entire surface of the M.Fn bar for a full second or more, it’s probably a good idea to leave this active. The EOS R is a responsive and versatile camera, and an important aspect of that is its ability to be easily customized, to suit the needs of the video or still-image operator. The button customization is extensive, but many will be drawn to the possibilities of the Multi-function bar. It’s easily accessed for many users when the camera is held normally (especially for users who don’t opt for the optional BG-E22 Battery Grip — the M.Fn bar is not duplicated on the BG-E22’s vertical controls). It can help streamline the process of calling up a frequently used feature, and its swipe capability lets you run through a range of potential settings, without even needing to remove your eye from the viewfinder. We recommend to anyone considering the EOS R to familiarize themselves with what’s possible, and to give the Multi-function bar a try.